Jess and the gang: Want to Change Your Life? Sometimes life changes are planned, are expected. Sometimes, they come when we least expect it, from places we NEVER would have expected it. Last week was one of these such incidences for me. Ian bought a new toothpaste. I know, not too exciting. There have been ads on tv over here about ISO-active toothpaste. It shows the toothpaste getting all foamy and cleaning where no other toothpaste will clean. So, Ian decided to try it out. He landed on the Aquafresh version. My life will never be the same! I have never been loyal to any toothpaste. I didn't really care how my teeth got cleaned. I didn't even care that much how often they got cleaned. Insert Aquafresh ISO-action toothpaste. I look forward to brushing my teeth. The foaming action is just so exciting. And, the clean feeling afterward, UNBELIEVABLE! This toothpaste has truly changed my life! Are you ready for a change? I think its time you go get some as well. 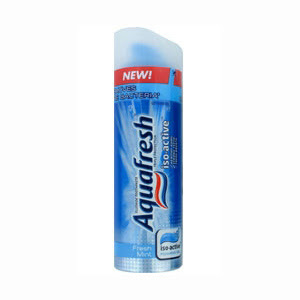 You should apply to be a spokes person for the aquafresh! I am very, very intrigued. Anna - I think it's definitely worth a try. Be sure to not use too much though, as it foams like crazy. The first time I used it, I used a normal amount and it was way too much...I was seriously foaming at the mouth and all over the sink.